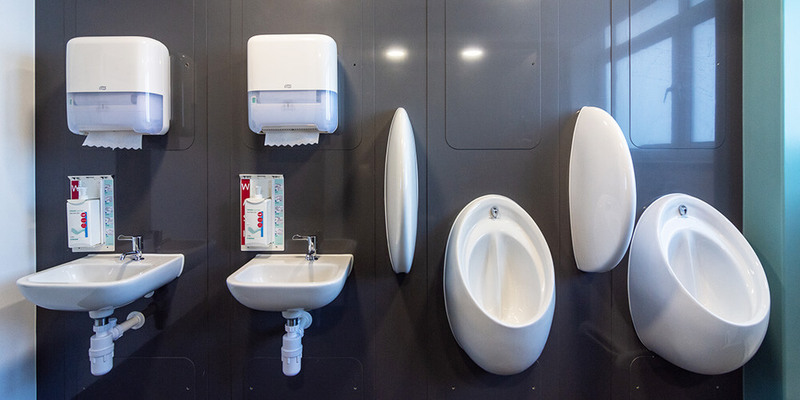 Bioclad IPS’ are modern made to measure modular IPS units designed to encapsulate the services and pipework for an aesthetically pleasing hygienic finish to a common trade problem. Pre-fabricated with as few joints as practical, fully wrapped in Bioclad antimicrobial PVC for an ultra-hygienic unit. Each IPS unit has hinged and lockable access panels for security and ease of maintenance to the services. Bioclad are partnering with major sanitaryware manufacturers, and are therefore able to competitively offer our IPS units supplied with or without HBN-0010 Part C compliant sanitaryware. The Bioclad IPS systems are available in the full Bioclad colour range, giving you a choice of plain, cool, vibrant and aesthetically pleasing colours to suit your project type. See the colours and finishes tab. 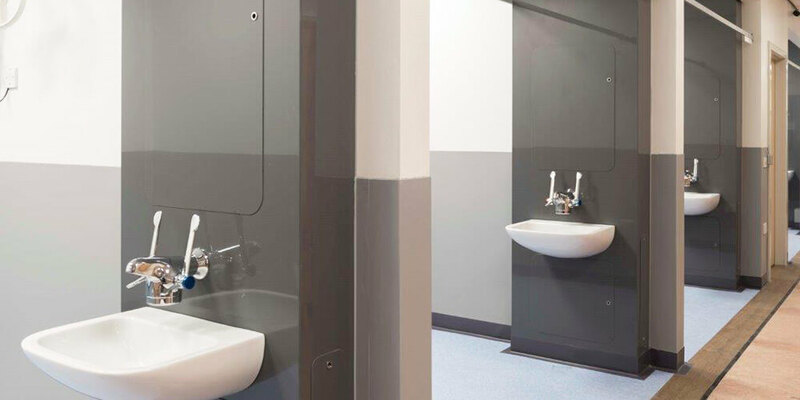 IPS Wall Panelling – Designed to encapsulate the site services, BioPod® IPS wall panelling is an aesthetically pleasing, hygienic finish to a common trade problem. Pre-fabricated with no horizontal joints, it comes complete with built-in hinged and lockable access panels and is wrapped in BioClad® antimicrobial wall cladding. With only a 2.5mm panel overlap detail, the frame and plinth offers a neat, hygienic sealed joint to the vinyl floor and adjacent walls. Internal, external corners and returns are pre-formed to eliminate the need for mastic joints. Supplied with HBN10 compliant sanitaryware. IPS Unit – Designed to encapsulate the pipework, BioPod® is an aesthetically pleasing, hygienic finish to a common trade problem. Pre-fabricated with no joints, it comes complete with built-in hinged and lockable access panels, wrapped in BioClad® antimicrobial wall cladding. The product is designed to offer a joint free, fully accessible, ultra-hygienic unit, that is easy to install, but even easier to maintain. Supplied with HBN10 compliant sanitaryware. Our IPS System is available in various vivid and pastel colours and finishes to add vibrancy to your hygienic environment. For more information on the cladding colours we provide, see the ‘Colours and Finishes’ tab. Preparation: Substrate is required to be structurally sound and capable of holding the fixed unit. Installation method (with plinth detail): BioPod to be supported by plinth with overlapping detail fixed to the vinyl flooring, using BioClad clear seal sealant. BioPod to be fixed to the substrate using the bracket system provided. Manufactured to suit ceiling height 3000mm max. Bioclad have staff with over 20 years of knowledge of IPS systems, building and healthcare sectors to advise, and see your project through from concept to completion. External Specification advisors who will guide you through specifying the correct products to suit your project needs and specific room layouts. Bioclad are partnering with major sanitaryware manufacturers, to offer our IPS units supplied with HBN-0010 Part C compliant sanitaryware. We have a close partnership with Ideal Standard and can offer their full HBN-0010 range within our standard lead time. Once an order is placed, our in house design team will produce full detailed working drawings for approval, and we will support and guide you through this process. As we only specialise in the Healthcare sector, we have a market leading delivery time of 10-15 working days from sign off of the production drawings, to help you complete your project in a timely manner.